In stock form, a Mazda Miata from any generation of the car's production will be a powerful track car. The only issue is the open top. 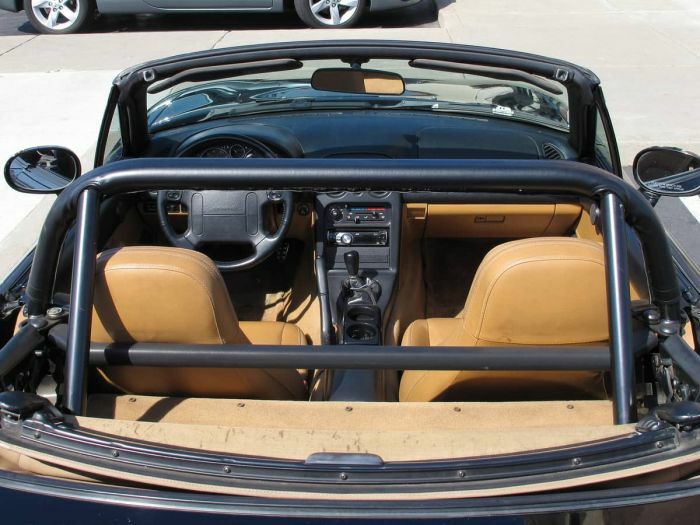 The Miata's convertible roof is great on nice warm sunny days in May, but any organization which is running a track day will want you to get a roll bar before you participate. You need the protection which comes from a strong steel frame over your head. But not all roll-bars are created equal, and there are things you should know before you drop the cash for one. So you've got your Miata. It's loads of fun. You've taken it to a few autocrosses, you've had nice sunny days driving on hilly roads. It seems just about perfect, but for some reason, you think it needs a rollbar. Maybe you've seen that horrifying picture of a rolled NB Miata (if you Google it, be warned: its pretty shocking), or maybe you're itching for some track actions. Either way, there are a few things you should know before you buy. 1. Not all roll bars are created equal. When you first search for roll bars, you'll certainly find the nice, shiny, hoop-looking monstrosities. They're often much cheaper than their flat black scaffolding-like counterparts, and so you might say "why not get this one? It's not like it's going to make the car more unsafe." Actually, it will. First of all, these chrome bling-bars are not designed to stop the weight of an upside-down car from smashing your melon. They will instantly crumple under the load, and will only serve as sharp crushed metal directly behind your head. Even if they were strong enough to take the hit, the vast majority of these bars don't even stand above the driver's seat, which means that your head will hit the ground before your bar does. In addition, these bars have the added safety concern which comes with all roll bars. But that will be discussed later. You'll save money if you buy one of these tin-can chrome units, and if you would rather be put out of your misery in an accident, they may be for you. But if survival is your motivation, then you'll have to drop the extra cash for a real rool bar. Here's what you want if you're looking for one. First, it needs to be above your head. This is pretty obvious. It the case of a crash, you want to be kept from slamming into the ground, so the bar needs to hit the ground first. Next, the bar should be well reinforced. There are a few different strong roll bar designs, and each one has different characteristics. You can look at a pretty good list over at Track Dog Racing's website. Finally, You'll want one which is firmly mounted into the chassis of the car. Some require welding, which is arguably stronger, but usually more work, and some are bolt-in. As long as it's secured to a strong part of the unibody, you should have the desired protection. While there is certainly an advantage in having protection from rolling over, there is a risk which comes along with having the steel hoop in the car. The main concern is for your head again. If you are hit from the rear, your noggin will be thrown backwards. Depending on your height and the height of the bar, the melon may make sudden and violent content with a steel tube. Juice may be spilled. If you're particularly tall, this may be unavoidable, but there are taller bars available which may reduce the risk. A racing seat may also be a good idea. 3. Just having the bar does not make you track day ready. Track day organizations which require roll bars are primarily concerned with your safety. They want to make sure that you are going to have a good time not just while you're there, but also want to make sure that you can have good times after you're done. Being dead is a bit of a hindrance to good times, unless there are track days in heaven. But since organizers can't guarantee your eternal happiness, it's easier to just keep you from dying. To this end, they want to make sure that your roll bar works well. A track-day requirement for your Miata roll-bar which is often overlooked is the broomstick test. This is a test which ensures that your roll bar is sufficiently tall to protect you in your Miata. This is how it works: you sit in your Miata's driver seat with you helmet on. Then a broomstick is put over your head, one end resting on your roll bar, the other on the windshield frame, so that it is parallel to the car. Your head needs to be at least two inches below the broomstick to pass. They will also check to make sure that your bar is a quality unit, so there's another reason to make sure you're not buying one of those abhorrent chrome style bars. Having a roll bar in my Miata made the car that much more fun, since the risk of rollover, as unlikely as it may be in a car that low, is much less of a concern. I had the double hoop style, and my six-foot-two frame was not hindered in the least. My head went all the way back until it contacted the headrest without hitting the roll bar, so if that is a concern for you, the double hoop style may be a good option, although you should always check with the manufacturer. This article is certainly not meant to be a comprehensive guide, so make sure you do some solid research, and get a real roll bar in your Mazda Miata. i definitely want a "real rool bar". are there any designs that can be adjusted or added to for additional protection (height) on track day?